There are many differences between experiencing a track on speakers and on headphones, and these are mostly to do with how the human auditory system perceives sound. With real-world sounds, the brain processes the two audio streams from your left and right ears and analyses the differences in frequency and timing between them to distinguish the direction of a sound. With headphones, your two ears are fed the audio stream at precisely the same time. This results in a sound that seems to be coming from inside your head rather than in front of you. Any panned instruments will seem more widely spaced than normal, and reverbs and delays will appear far wider and deeper. With monitors, natural room reverb smoothes more aggressive soundwaves and adds ambience, but listening on headphones allows you to experience a sound without room acoustics. This results in audio elements without much reverb (snappy beats and clean vocals, for example) coming across as more bright and aggressive. The phenomena we've just described will often give the impression of a more clinical sound over headphones than listening on monitors will. This can make club mixes that are destined for dancefloor sound systems sound oddly sterile through cans. However, this isn't necessarily a bad thing. With headphones, you'll hear detail in tracks that you may have missed with normal monitors. This is especially useful when resolving tricky vocal timings or pitching issues. If you do a lot of sample chopping or audio restoration, then headphones are very useful for spotting unwanted distortion, clipping and clicks. You can utilise them to check for any nasty artefacts when timestretching, as well as honing in on the start and end of samples that might need short fade-ins/outs added to stop them clicking. If you only ever use headphones for mixing, it's all too easy to misjudge your mixes. Common mistakes include making the stereo field too narrow, and not splashing enough reverb onto vocals and synth parts, leaving them overly dry. 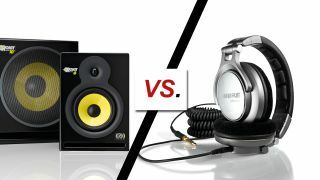 Judging how much of any effect to use should be a decision that's made through listening on both cans and monitors. A well produced track should sound great on everything from laptop speakers to a high-end hi-fi. Don't forget: just because you can mix on headphones doesn't necessarily mean that you should. A reasonable set of nearfield monitors is always a better option for long-term listening, although it's perfectly possible to write a track mainly on headphones and then check it on your monitors only during the final stage of a mixdown. If you do this, however, be mindful of the detail of your mix. Panning, reverb and delay effects will be far more pronounced on headphones than over speakers. You will probably need to increase the wet levels of your plugins or widen the panning so that your effects translate more effectively over speakers. Some of the more subtle tracks in a mix - vocal harmonies and background synth lines, for example - will probably have to be turned up to make them clearly audible when played through loudspeakers. It's also all too easy to miscalculate the levels of percussion elements in a headphone-only mix. The kick and snare drums will probably need turning down a touch, and more subtle elements like hi-hats and shakers turned up, so that they can be heard above the other parts. Mixing with headphones enables you to hear greater changes in dynamics than you'll pick up through monitors, so you may also need to add extra compression to vocals and guitars in order to keep the dynamics more consistent. One of the toughest things about mixing on headphones is that it's very difficult to judge the stereo width of a track when it's being pumped straight into your ears. Using a standard set of monitors, each ear hears the output of the left and right channels, but in different proportions. Imagine a 'normal' studio environment with left and right speakers and a listener positioned in front of them: Your right ear will hear more of the signal from the right speaker than the left. The signal from the left speaker will also be heard by the right ear, but at a slightly lower volume and with a short delay. In contrast, when you listen to a track on headphones, the right and left channels are pumped directly into the corresponding ear without any mixing of the signals. To emulate monitor mixing on a pair of cans, you would need to introduce some 'crossfeed'. You may have come across this expression in relation to channel/console/tape-emulation plugins that allow signal bleed between channels. When it comes to emulating the sound of speakers on headphones, the concept is the same but with more of the signal shared between the left and right channels. A crude crossfeed effect can be emulated in any DAW. Feeding the left/right channels into each other essentially makes the signal mono, reducing the stereo width, so all you have to do is use a simple stereo imager/width plugin and reduce the width. This is the same as reducing the Side level in a mid/side plugin. This kind of crossfeed is very basic and is really more of a mono compatibility test - it doesn't emulate the time delay between the left and right speakers' outputs reaching your ears, for one thing. For that, you'll need to delay the left/right channels and pan them to opposite sides. Depending on your delay time and the audio you're working with, you may find that some audible comb filtering crops up as a result of adding the delay. You can adjust the crossfeed track's volume and delay times to compensate for this, but some artefacts will be inevitable, just like listening to speakers in a real room. There are a number of other subtle factors that come into play when listening to monitors, including the room acoustics changing the harmonic content and introducing reflections. It's pretty difficult to emulate these effectively using DIY solutions, but a few developers have created software and hardware to try and model various real-life listening scenarios for those mixing just on headphones. They often include controls for adjusting the distance between the 'speakers' and the 'listener', and between the two speakers themselves. You may also find controls for speaker angle and the frequency characteristics of the emulated 'room'. Some software even attempts to mimic the sound of particular speaker drivers and cabinets. The usefulness of these tools can vary wildly, so audition demo versions first to see which ones sound good to you. If you've been mixing on 'phones for a while and are used to the sound, then running your mixes through these emulators can sound strange at first: the mix becomes much narrower and will seem to lose some top-end frequencies. But don't worry, as you'll get used to the sound pretty quickly. If you're in any doubt about what you're hearing, try loading a couple of your favourite reference tracks into your DAW and using the plugins to simulate crossfeed on those. One thing to be aware of, though: always be sure to bypass the crossfeed emulation when you're bouncing your track down, as otherwise it'll sound very odd indeed over monitors! For loads more on working on headphone check out the May issue of Computer Music (CM 190) which is on sale now.